Totaling nearly 150,000 acres, the two new reserves declared in Antioquia, Colombia protect rich Andean cloud forests home to stunning biodiversity – including a species of monkey found nowhere else in the world. 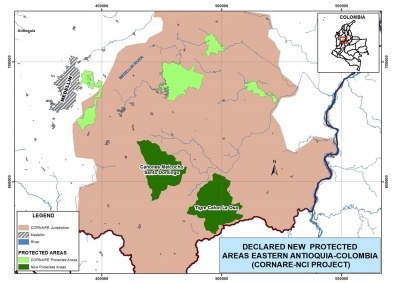 NCI’s partnership with CORNARE, the regional environmental authority that declared the reserves, has enabled them to more than double the number of acres protected by regional reserves in southern Antioquia. In July 2015, two new reserves totaling nearly 150,000 acres were declared in Colombia’s species-rich state of Antioquia by CORNARE, the state’s southeastern regional environmental authority. The Melcócho-Santo Domingo Reserve (65,538 acres) and Tigre-Calón-La Osa Reserve (76,224 acres) were created in part through NCI’s funding and collaboration on the technical work needed to declare the protected areas. These declarations will have a significant impact on local people, as they protect the headwaters of the Samaná River, ensuring a clean and steady water supply for four municipalities. In the municipality of Carmen de Viboral, community members celebrated the declaration of the reserve after strongly advocating for the protection of their water supply. Both reserves protect rich Andean cloud forests home to stunning biodiversity, and are particularly unique as they fall within the Nechí Nare Endemism Center – an area where many species survived during the last ice age (known as a Pleistocene refuge). Key species include the Silvery-brown Bare-face Tamarin (a species of monkey found nowhere else in the world) and the endangered Mountain Tapir, as well as 330 species of birds. Just under one year ago, NCI and CORNARE formed a partnership to establish new reserves in the regional protected areas system. With NCI’s support, CORNARE contracted a team of professionals from the Darién Foundation and a local university to conduct the technical work required. This partnership with NCI has enabled CORNARE to more than double the number of acres protected by regional reserves in southern Antioquia – a major accomplishment for a country so rich in biodiversity. NCI is continuing to partner with a number of regional environmental authorities in Colombia to support the creation of new protected areas. Major opportunities exist to achieve such declarations, as there is a mandate by the national government to designate regional reserve systems and mining exclusion zones. Although these regional authorities receive funding from the national government, additional funds are needed to create strong reserve systems and ensure their ongoing management. 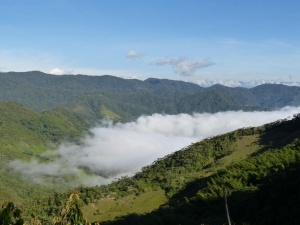 NCI is filling this gap by providing matching funds to speed the declaration of protected areas while there is still time, and is currently facilitating the creation of an additional 175,000 acres of protected areas in Antioquia and Nariño, with more to follow.